Massage cushions are some of the simplest and most-effective products for relieving stress and back pain. They allow you to turn your home, office, or car chair into a personal masseuse thereby helping you relax, sleep better, and have a healthier life. Massage cushions with heat offer the relaxing benefits of kneading and heat at the comfort of your office, living room or car. They are great for a stiff neck, shoulder pain, tension, headache, arthritis, stress, and back pain. Here are a few reasons why you should get one. Easy to use – Massage cushions are easy set up and use. You just strap them to the chair of your choice and connect to a power source; then choose the intensity mode, sit back and relax. Inexpensive – Massage cushions are a lot cheaper than massage chairs or paying for a massage therapist. Portability and convenience – Massage cushions are easy to carry hence you can use them anywhere and at any time. Some of them come with a battery pack enabling you to use them when away from power connections. Massage benefits – The benefits of massage are enough in and of themselves, ranging from treating insomnia, anxiety and stress to boosting mood, relaxation and the immune system. There are dozens and dozens of massage cushions out there in the marketplace. Some are effective while others are just gimmicks. Therefore, choosing the best one can be a challenging and frustrating task. Luckily, we have done the hard work for you and compiled a list of the top 6 massage cushions with a heating function. This list will help you compare the top massage cushions and get a quick sense of which one best suits your needs. Top on our list is the Zyllion neck and back massage cushion. It has three massage variations: lower back, upper back, and full back. It can help you relieve muscular tension and back pains, and improve blood circulation. 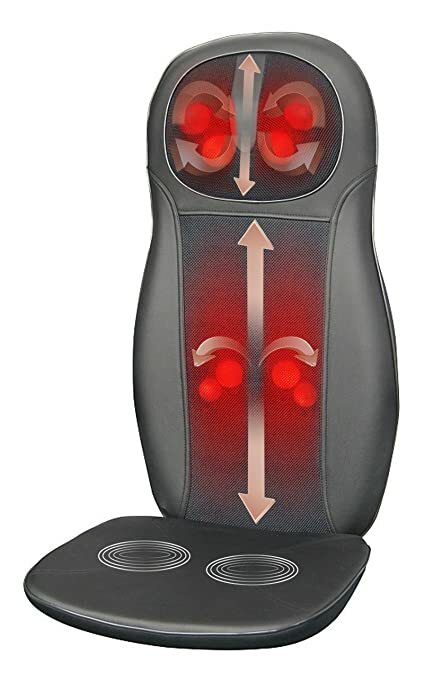 This FDA listed massage cushion has 4 shiatsu massage nodes which work together to give you a rolling and deep kneading massage. The nodes also have a soothing heat function which you can turn on and off. 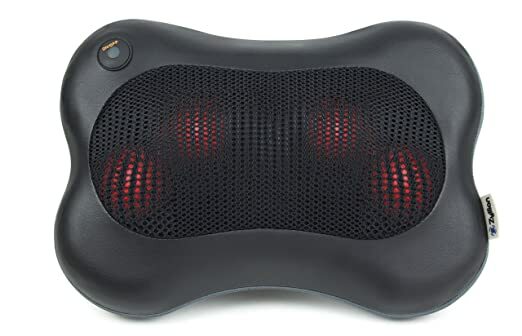 The Gideon luxury massage cushion is great for relieving tension, pain, aches, and knots, whether at your home, workplace or even in your car. It offers many massaging options, allowing you to get a fully customized massage. 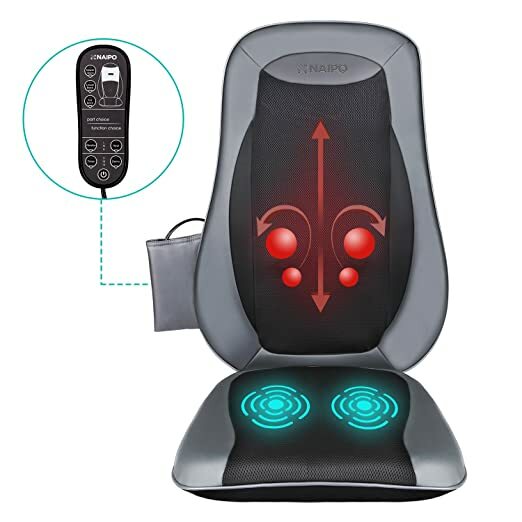 It delivers an intense massage through the 4 shiatsu massage nodes and provides adjustable spot focus settings for precision and effectiveness. It offers both heating and cooling functions, which makes it suitable for any kind of weather. The cushion also has a vibration mode which allows you to choose low, medium or high vibration. This is a handy size, ultra slim massage cushion/pillow that weighs about 3.5 pounds. It’s small size and light weight makes it quite portable and ideal for the neck, lower back, upper back, abdomen, calf, and legs. It delivers a shiatsu massage with its 4 massager nodes that apply a deep therapeutic massage. Though small in size, this FDA registered cushion is very powerful and gives an intense massage. Its motors are quiet and it has great safety measures such as an overheat protection. The HoMedics is one of the best massage cushions for those who need an intense massage. Weighing about 3.9 pounds, the cushion has 4 independent nodes and offers 3 massage styles: spot, rolling and kneading. It’s designed for maximum area coverage around your back and shoulders. It also comes with a removable cover that allows you to raise or lower the intensity of the massage with its buffer. It also has a remote control that you can program. Its soothing heat function warms your back for a therapeutic massage. 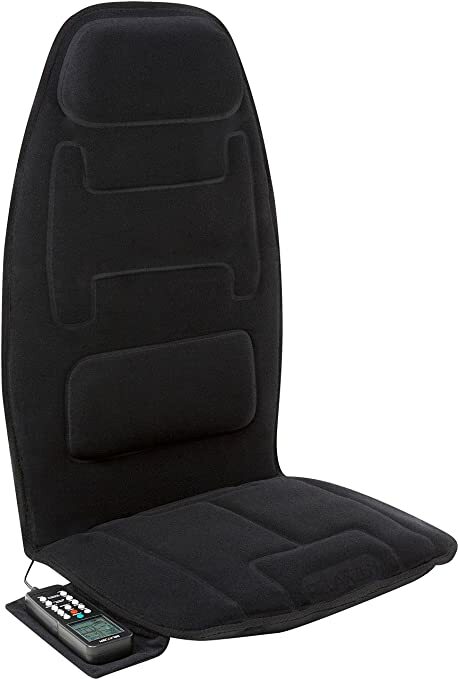 The Naipo Back Seat Massager is a great massage cushion that you can use at your workplace, home or in your car. It offers rolling, kneading, and vibration massages that help you relax and eases painful kinks, tension and aches. The cushion has three levels of vibration which you can adjust depending on your preference. It comes with 4 powerful 3D massage nodes which imitate the hands of a real massage therapist and can massage your upper, lower, and full back area. You can target specific areas or get a full-on massage. The heating feature can help relieve some pain and help you to relax. 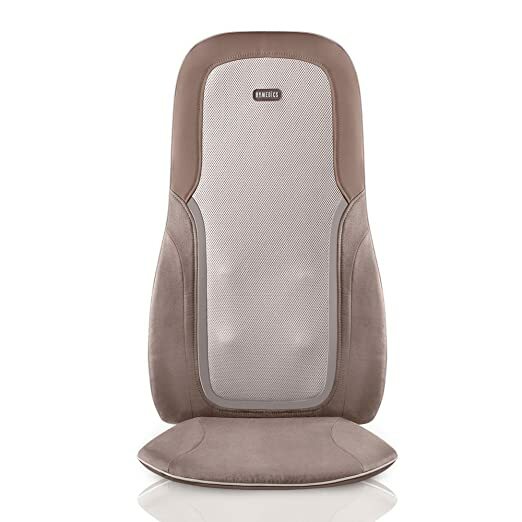 This 10-motor massage cushion comes with a neck rest and lumbar support pads. It offers eight different intensities and speed, which allow you to adjust to your preference. The 10 powerful motors target lower back, mid back, upper back, and thighs. It also comes with Ergo hand control that allows you to customize the zones, intensity levels, speed, and modes settings. You can use it on your car seat, home chair or office seat. Massage cushions with heat can give you a perfect relaxation experience and help you relieve pain and stress. Having gone through the list, you’re now in a better position to choose a massage cushion that suits your needs.